If you're anything like me, once a month week you actually wash, dry and style your hair and state, "I will do this more often." This degenerates into days of mom buns and hats so now, I've switched tactics. The bun is going to happen so let's embrace it. Please note: I am a guru of NOTHING so I claim no hair professionalism or photography skills. 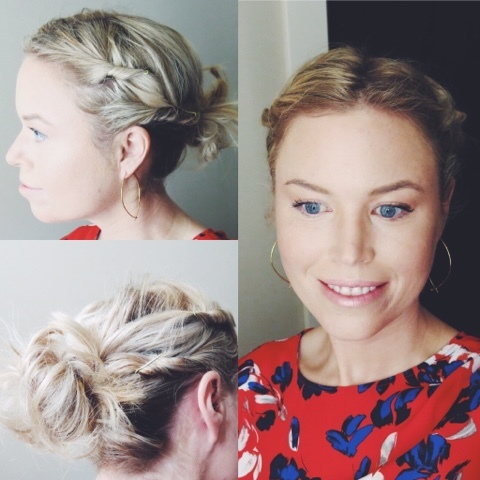 These are real-life up-dos that I've gleaned over the years. I have wavy/frizzy/somewhat curly hair that is shoulder length. Feel free to judge what will work for you and carry on! 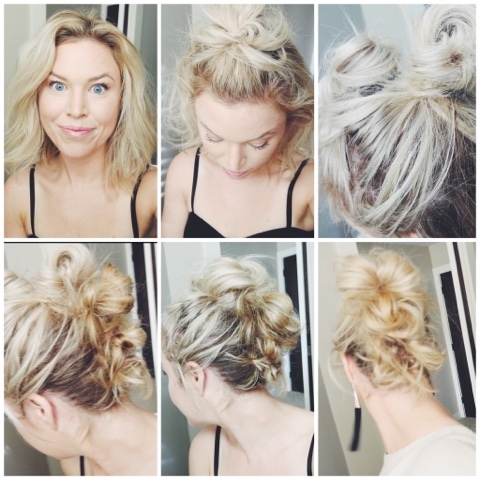 In my humble opinion, the top knot is like motherhood: It works best when you don't strive for perfection, you go with it and you embrace the chaos. That said, I don't wash or brush my hair before creating any of these looks and they take less than a minute. Dog toy on the floor not included. Needed: Those little elastics you torture your kids with. Unstyled/unwashed hair. Or just hair. This look is inspired by the way I put ponytails in Gabby's hair. Apparently I am anti-hair parting. Poor child. All her hair doesn't fit in one elastic so I use the tiny ones (I like the Goody brand because they don't suddenly snap and leave you hanging) and attach them together. 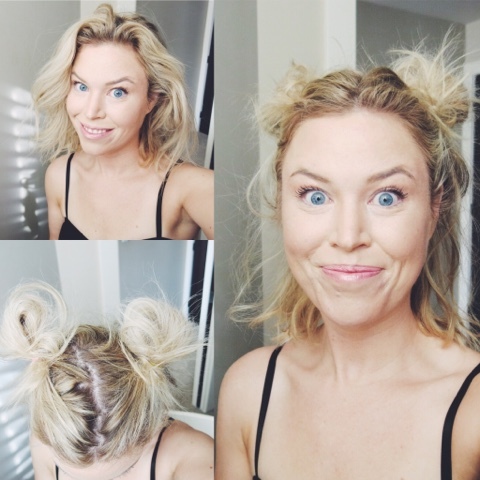 To create The Unicorn, I take 4 or 5 little elastics and beginning near the front of my head (further forward and close to the forehead than feels normal), I start pulling my hair into little messy buns, one behind the other all the way down my head. 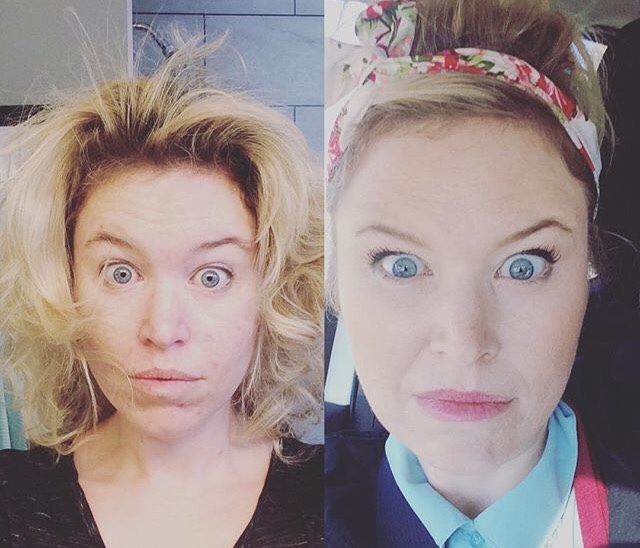 Depending on your caffeine level, bedhead and the position of the moon, this is going to look like anything from a giant messy bun to an elegant up-do. 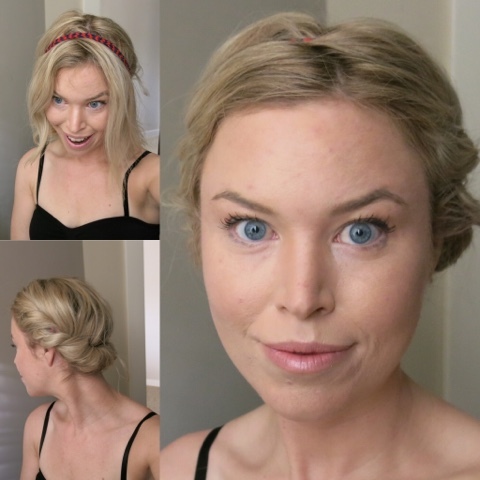 It's fantastic for shorter hair and making you look like you have way more hair than you actually do (5 or 6 mini-elastics are slightly cheaper than hair extensions, I find). 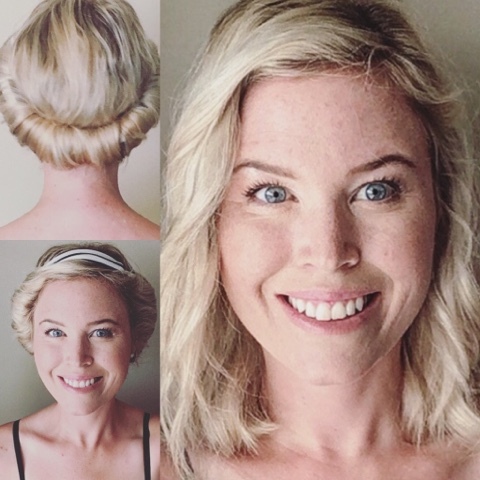 If you succumbed to the bob, the lob, the mob (just kidding, I can't help you there. 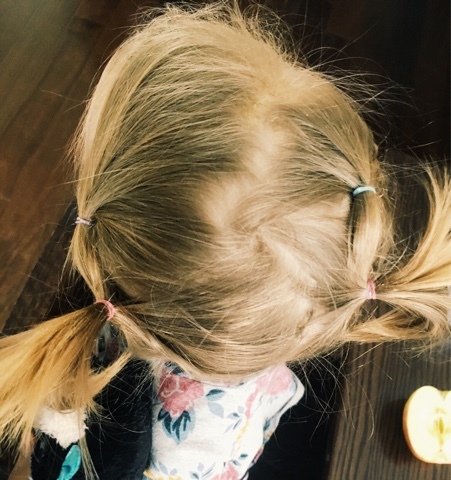 Good luck with the tiny humans), this might be the hair hack for you. You can also channel Gwen Stefani circa 1990 or as my toddler calls it, The Puppy Dog. 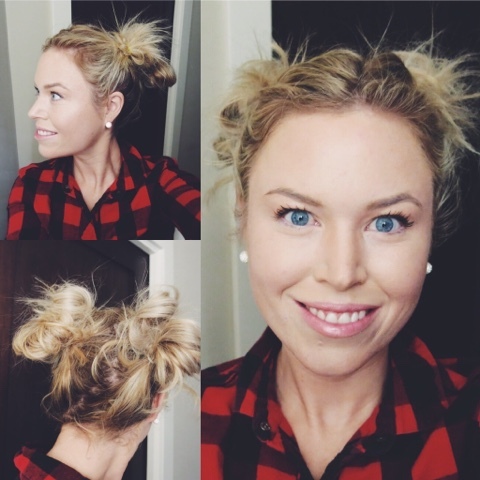 I created two higher buns and then two lower buns directly underneath them to create this easy look. Type A personalities, please note that I never ever actually create a clean part in my hair and honestly, I don't think it matters, but you do you. This might look classier if you didn't use your toddlers coloured hair stuff but at this rate, I may never know. We all love the look of braided up-dos but by the time I'm done fashioning my almost four-year-old into Elsa and my almost two-year-old into Moana, I'm still channeling Ursula and out of time and energy. 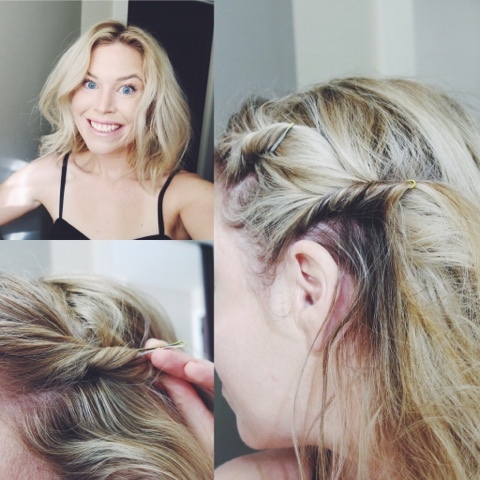 If you want to look fancy without the skill or time of braiding, just twist and pin. 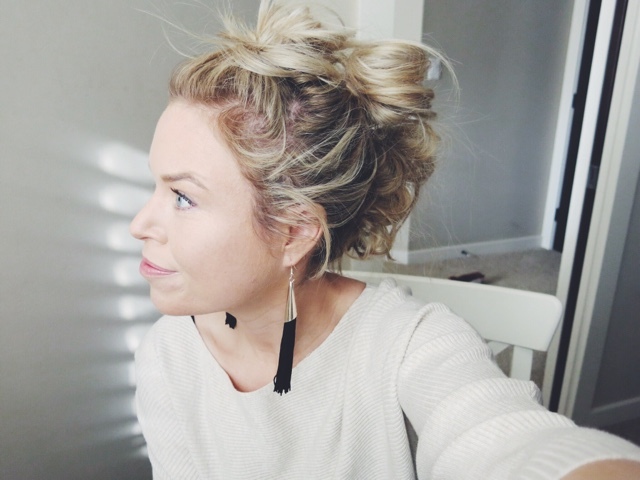 Twisting a few of your front strands of hair before you throw up the old mom bun makes it look like you tried... but ya didn't. 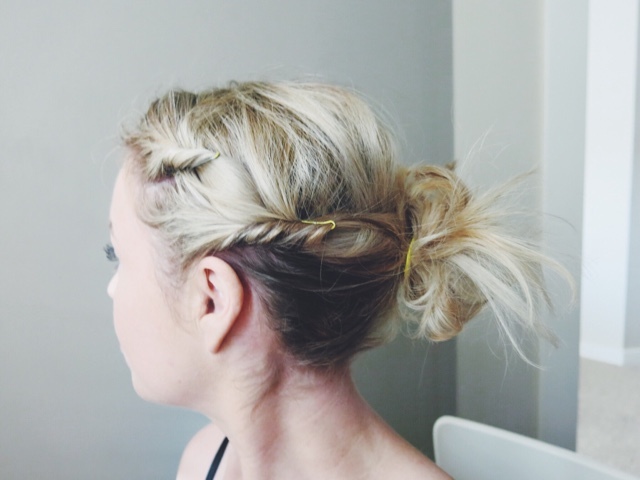 Make sure to attach your bobby pin against the grain of your hair (push it back toward the twist you created) to really hold. 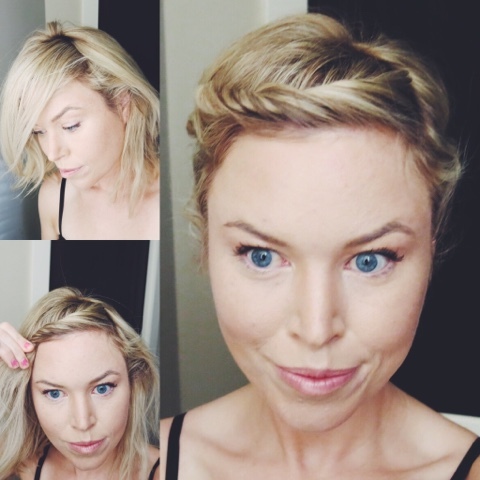 You can twist one or two or seven strands back depending on how many bobby pins you find on your floor. Don't worry about evenness or perfection. Trust me. 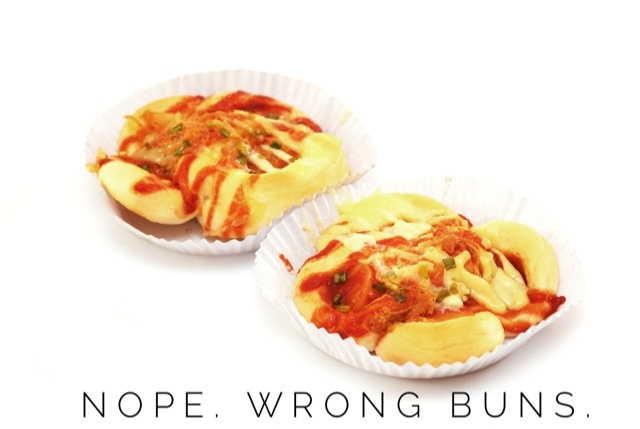 If I do a higher bun, I twist up the hair from the nape of my neck too to keep it in place and still be pretty. 3. 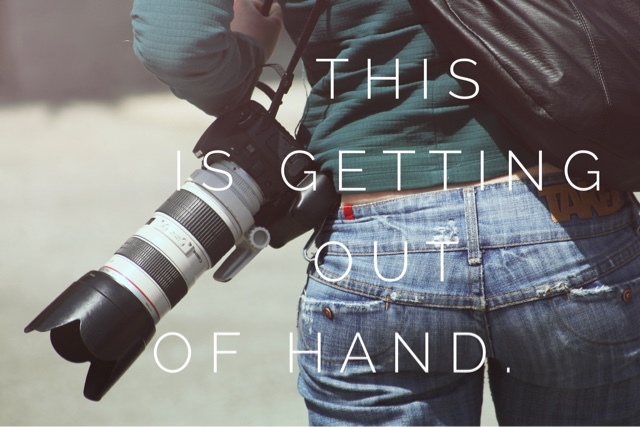 The Art of Distraction. Needed: headband, elastic, maybe lipstick. Headbands are fantastic for... well, everything. Lately I've been partial to the $2 kind that have a wire inside and that you twist to close. 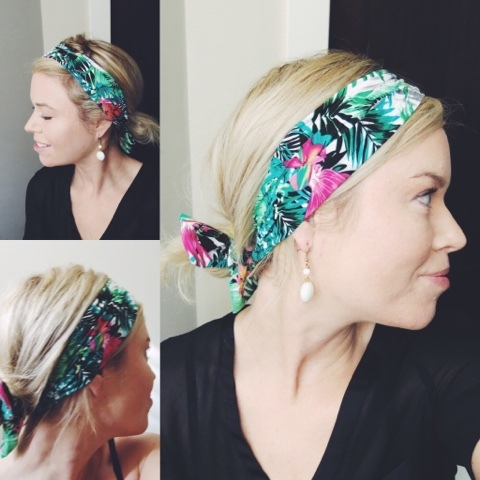 But before you buy one, just steal one of your kids' headbands. They never wear them for longer than 3 minutes anyway. This is not my favourite look. I think I am channeling a pineapple. Someone else however might look great. Is your hair greasy? Headband. Going to the gym? Headband. You have those tiny baby hairs growing back in postpartum? Headband. You can't face the world? Headband. This look requires a headband that stays in place. 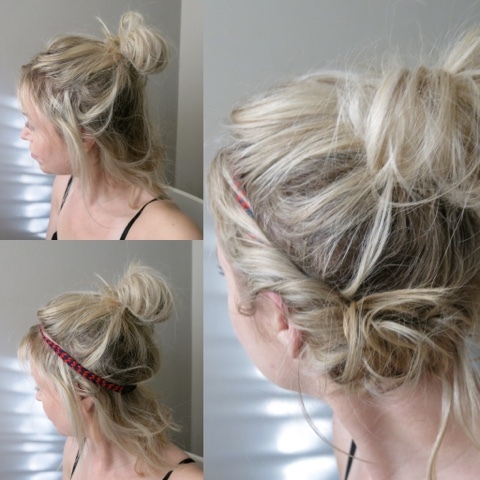 Shove it on top of the mess that is your morning hair and then just start tucking your hair in around it, beginning at the front and working your way back. Done, son. 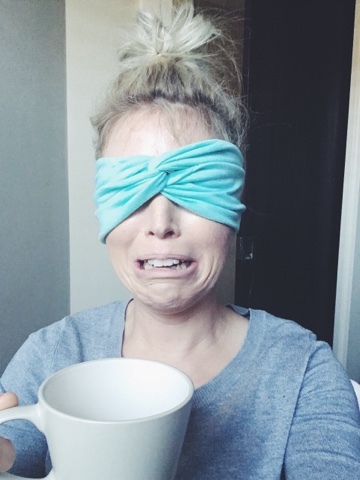 Where's my coffee? 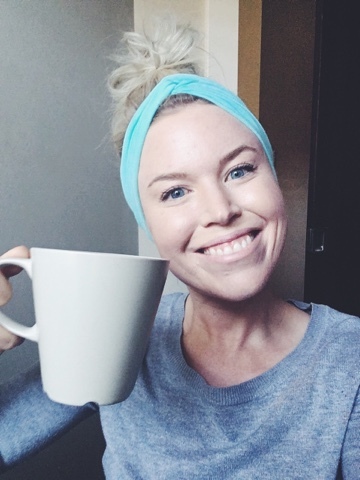 If you have really thick hair, you don't trust your headbands, you have those annoying baby hairs or you're growing out bangs, throw up a messy loose bun, pull all the wisps out all the way around and then headband and tuck those. Savvy Curls to the rescue! I had freckles once and the sun shone. Sob. Let winter be over. ... check out my post on the Savvy Curls wrap. 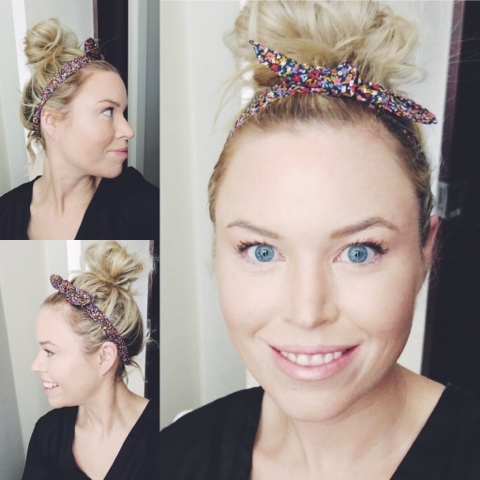 It's a headband that actually curls your wet hair while it dries. You can wear it out and it works. BRILLIANT. So those are my four go-to styles! 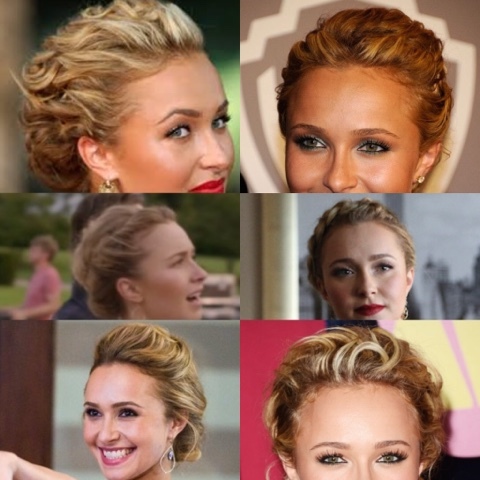 I know Pinterest can be a mom's worst enemy best friend, but lately I've been channeling my fancy up-do inspiration straight from Juliette Barnes. If you're not obsessed with Nashville (GUILTY, y'all), then you may know here as Hayden Panettiere. Can we say #hairgoals? Anyway, no matter the mop, chin up, sweetheart. This headband muffles the sound of my children's screams. Cheers! We'll get through any hairy situations this day throws at us because underneath it all, we hold to that secret superpower: if we HAD TO, we could always shower and actually style our hair. Am I the only one who needs to believe this? 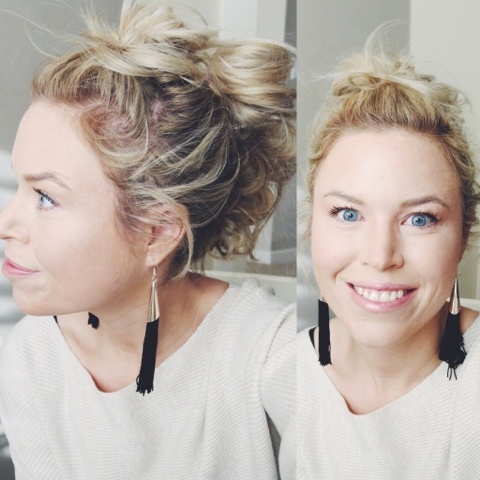 What's your go-to top knot look? 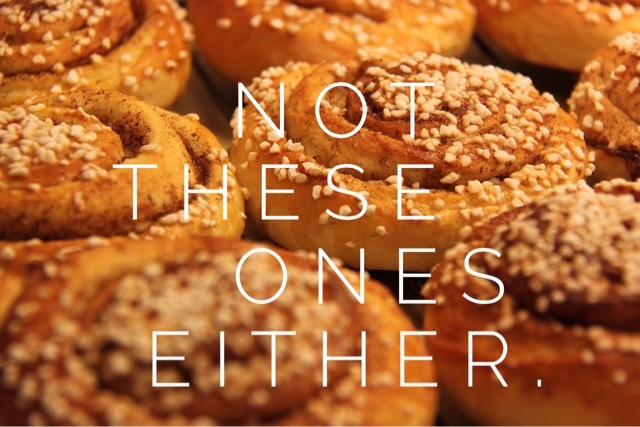 We'd love to know if you're going to try any of these. 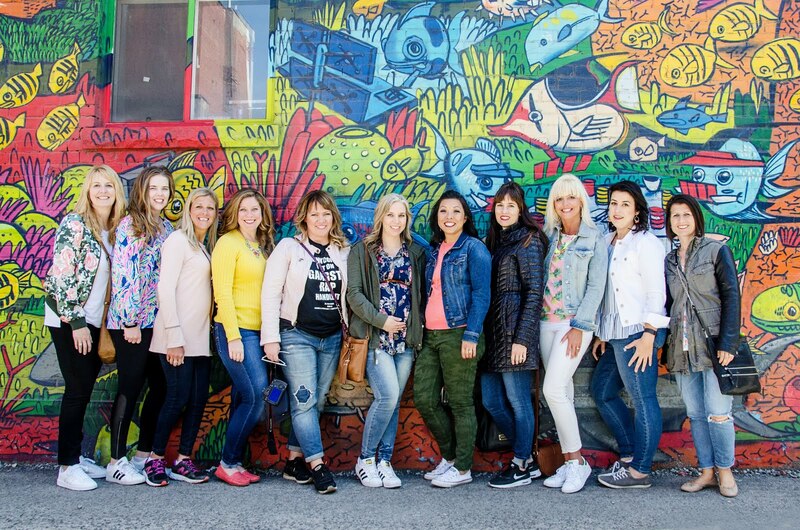 Show us your look and tag @tbblog! If you liked this post, why not give it a share?